The Maserati MC12 GT1 is a great piece of racing machinery. One problem; some people think of it more as a quasi-prototype, the IMSA had its performance heavily restricted in the ALMS, and the ACO had it banned from racing in the LMGT1 class at a certain well-known French endurance race. Well, if everyone thinks it's a prototype, then why not turn it into an actual prototype? Hence what inspired me, the head of Suneo Honekawa Motorsports, to turn the MC12 GT1 into an LMP2 machine. And so, here I am introducing you to the MASERATI MC12 LMP. Its suspension, tyres, transmission and engine are all brand-new. SHM took the same 6.0 litre V8 engine used by Holden in its Australian V8 Supercar racers, and further developed it in association with GM (who already raced at Le mans with its Corvette programme) for better durability and performance. The modifications allowed the VE Commodore-derived unit to run at a dizzying 10,000 RPM. Even when fitted with the power restrictor required to run in the P2 class, the torque put to the pavement by this Aussie-developed power block catapults this car right into the middle of the battlefield, and the banshee-like screaming emitted from this car's flame-spitting exhausts makes it easy to spot in a crowd. Speaking of being easy to spot in a crowd, Suneo Honekawa Motorsports pulled out all the stops to ensure that the cars would be easy to spot on their debut in 2008. Popular Japanese anime character "Doraemon" was given a spot on the #21 car, whilst his friends Nobita and Suneo adorned the #22 and #23 cars respectively. Each car sported its own unique colours as well. And so, what happens from here? That's up to you to decide! Take this car to the track and make yourself noted in the unique Italian-Japanese-Australian crossover of a prototype that is known only as the MASERATI MC12 LMP! Original vehicle model: ©EnduRacers Modding Team. Doraemon artwork: ©Fujiko-Pro, Shogakukan, TV Asahi, Shin-ei and ADK. Track featured in thumbnail: Katsuo's Fuji Speedway. If you find a bug, have a problem or simply want to give me an idea for an improvement, just do the exact same thing. Get in touch with me by sending an rMail message to "TheLuigi755". To install, simply drop the contents of the .zip file into your rFactor folder. Make sure that you have the ENDURACERS ENDURANCE SERIES MOD (with all relevant service packs) installed as well. Not only is it required for this mod to function, but it also adds some extra LMP and GT cars for you to race against. I mean, who wouldn't want to run a Le Mans car against more Le Mans cars? There are currently no setups for Maserati MC12 LMP. Add a Setup. 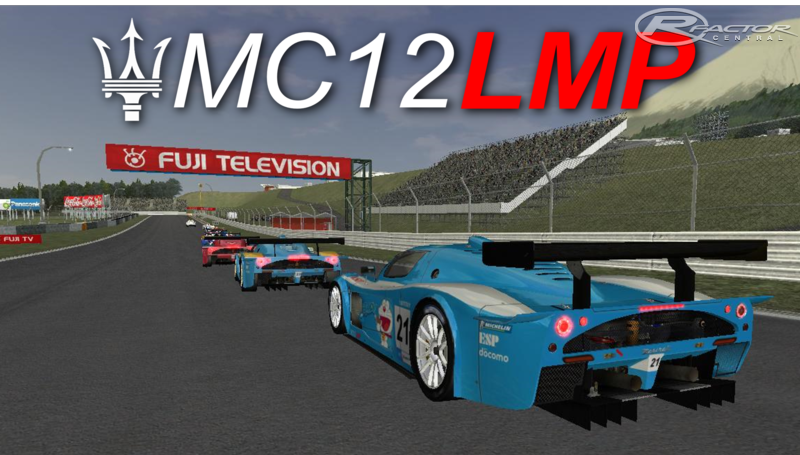 There are currently no car skins available for Maserati MC12 LMP. If you are a painter you can share skins for this mod via the Car Skins area. Visit the Spray Booth for painting tips & tricks. Love this car, I took one for a test drive the other day and was such a smooth, powerful ride.. I was never the same when I got back into my honda LOL!! Man what a great car. My friend let me drive his not too long ago and I cannot wait to buy one for myself.